It is a healthy combination made from whole wheat flour, dark choclate (72% cocoa), full of nuts and Baked..
Chocomosa is a chocolate filled samosa with the subtle spice blend of cinamon and clove. They deliciously melt in your mouth with the crunchy nutty bite. This can be served for snacks or served as a dessert in parties with ice cream. Add 1 tbsp of flour with 2-3 tbsp water mix well/ use melted butter. Melt chocolate in a microwave/double boiler. Add crushed nuts, peanut butter, ground clove, cinnamon mix together and set aside. Take 1 sheet of filo pastry and cut into two equal strips. Fold the rectangle across itself to form triangle by sealing the edges with the flour mixture and ensuring there are no any holes. Once triangle shape is obtained fill 1-2 tsp of chocolate filling and seal the edges of the triangle. Repeat the same with other sheets. Pre-heat the oven at 180 deg c , line the baking tray and place each samosas on the lined tray. Brush some butter on each samosas and bake for 8-10 minutes, turn once half way through cooking. I used homemade filo pastry (Recipe link) made of Whole wheat however you can use store bought one. 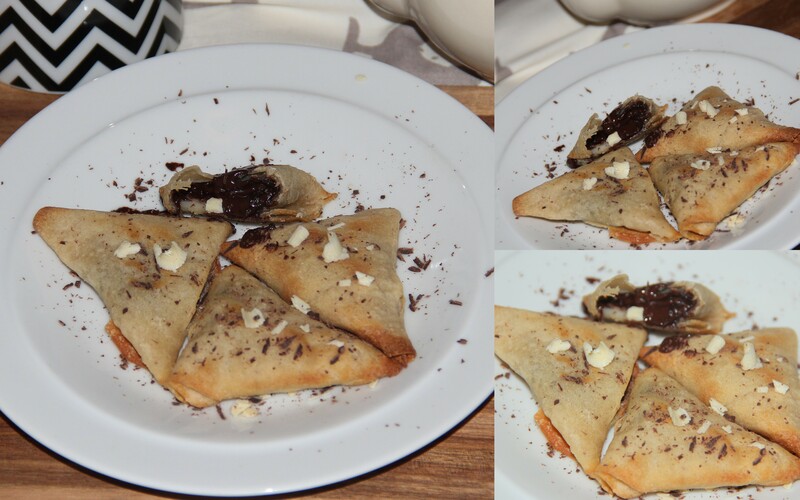 The sandwiching of filo sheets helps to prevent the chocolate from oozing out while baking. You can even deep fry the samosas. I am posting this recipe to Angie’s Fiesta Friday. Posted on August 14, 2014, in Appetizers, Indian, International, Kids recipes, Starters and tagged Baked Sweet samosas, Chitras healthy kitchen, Choclate Samosas, Chocomosas, drchdietfood. Bookmark the permalink. 61 Comments. Give me chocolate in any form , I am here 🙂 Wanna grab one Chitra 😀 I am also bringing Samosa this week…. Sure malar. …your most welcome and would be the luckiest if I ever get a chance to treat yourself. …. Thanx Arl. …very nice to know you and your world…. Thank you! Happy Fiesta Friday! Vidya feel good that you liked it…. These look so good, and no added sugar, so they MUST be healthy! Even better, you’ve taken me back to the chocolate croissants we could once buy until the only patisserie in town closed. Thank you so much. Charanya you always shower me with your sweet and lovely words….thanx a ton…..I can say you deserve “genius” crown than me as creating vegan and gluten free recipes are not that easy. ….you are definitely g8…. Thank you…chocolate lovers like me look to use them in all possible recipes. …as you rightly said chocolates you don’t need added sugar and they taste just perfect. …. Good recipe, have a good weekend. What a fantastic recipe! I could not resist these. These are really inspiring me! Great idea, would never if thought of doing it, they look soo tempting.